Transparency Market Research (TMR) has published a new report titled ‘Self-injection Devices Market - Global Industry Analysis, Size, Share, Growth, Trends, and Forecast, 2018–2026.’ According to the report, the global self injection devices market was valued at US$ 3,770.03 Mn in 2017. It is projected to expand at a CAGR of 13.4% from 2018 to 2026. Technological advancements in Self-injection devices, high prevalence of chronic disorders requiring frequent medication dosages, and rise in demand for home health care are anticipated to drive the global market in the next few years. North America is expected to dominate the global Self-injection devices market during the forecast period, followed by Europe. High prevalence of diabetes and autoimmune disorders, increase in the geriatric population, and rise in approvals of novel Self-injection devices in the U.S. and Europe are likely to drive the Self-injection devices market in these regions during the forecast period. The market in Asia Pacific is projected to expand at a high CAGR in the next few years. High prevalence and rise in the incidence rate of chronic diseases across the globe is a key factor driving the global Self-injection devices market. Rise in cancer, diabetes, multiple sclerosis, rheumatoid arthritis, and osteoporosis and increase in hormone-related disorders have fuelled the consumption of Self-injection devices in recent years. For instance, according to the International Diabetes Federation, in 2016, 422 million people worldwide were living with diabetes. It is predicted that by 2040, more than 10% of the world’s adult population, or around 642 million people, are likely to be affected by the disease. It is estimated that around 1.3 million people in the U.S. and more than 1% of the worlds population is affected by rheumatoid arthritis. Thus, high prevalence and substantial rise in the incidence rate of chronic diseases across the globe are key factors driving the global Self-injection devices market. The report offers a detailed segmentation of the global Self-injection devices market based on different product types and usage. Based on product type, the global market has been segmented into pen injectors, autoinjectors, and wearable injectors. The pen injectors segment dominated the global Self-injection devices in 2017, and the segment is likely to continue its dominance throughout the forecast period. The large share of pen injectors segment is primarily attributed to high volume of consumption of insulin pens, high prevalence of diabetes, and easy availability of the devices. Wearable injector devices are currently in the infancy stage of the product life cycle, They are being evaluated for various applications, especially for diabetes and other chronic disorders requiring large volume dosage of medications. The recently launched wearable injectors by West Pharmaceutical Services, Inc. and Insulate Corporation are increasingly gaining popularity among patients. Most companies such as Sorrel Medical, Sensile Medical, and Enable Injections are on the verge of launching their wearable injector devices for large volume and high viscosity biologic drugs in the coming years. Also, significant rise in the adoption of biologic drugs for the management of life long non-curable disorders, especially type 1 diabetes, rheumatoid arthritis, and osteoporosis, are expected to propel the wearable injectors market during the forecast period. In terms of usage, the global self-injection devices market has been segmented into disposable devices and re-usable devices. The disposable devices segment accounted for more than 70% of the global market in 2017. The segment is likely to continue its dominance throughout the forecast period. A large proportion (70% to 80%) of insulin-dependent diabetes patients in developed countries such as the U.S., Canada, the U.K., Germany, France, and Italy use disposable pens. Several patients that are currently using reusable pens are estimated to gradually switch to disposable ones during the forecast period. This is due to ease of use and convenience, patient preference, rise in the level of reimbursement, and increase in affordability, with disposable pens being used by an estimated 54% of insulin-dependent diabetics in 2026. The Self-injection devices market in Asia Pacific is projected to expand at a rapid CAGR of 14.1% during the forecast period. High prevalence of chronic disorders in highly populated countries, such as China and India, rapid improvement in health care infrastructure, increase in access to health care facilities, and rise in per capita health care expenditure in the region are likely to fuel the market in Asia Pacific during the forecast period. A large base of pharmaceutical and medical device companies in countries such as India, Japan, and China also drives the market in the region. Emerging economies and expansion of pharmaceutical markets in countries such as China, India, Indonesia, Singapore, Taiwan, and Thailand are expected to propel the market in Asia Pacific. The global Self-injection devices market is highly consolidated, with a few global players accounting for a major share in respective regions. Leading pharmaceutical and medical device companies are establishing strategic partnerships to develop novel Self-injection devices to differentiate their products in a highly competitive environment. 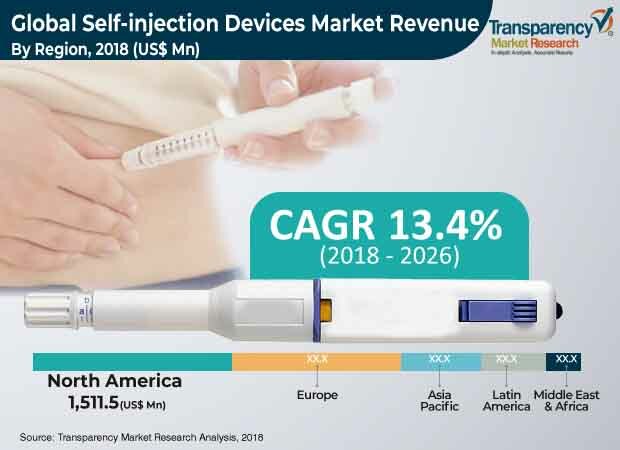 Leading players shaping the vendor landscape of the global Self-injection devices market are Becton, Dickinson and Company, Gerresheimer AG, Insulet Corporation, Ypsomed AG, Antares Pharma, Inc., West Pharmaceutical Services, Inc., Consort Medical plc, Sensile Medical AG, Owen Mumford Ltd., SHL Group, and Wilhelm Haselmeier GmbH & Co. KG.